Location: Deseşti is in the valley of the Mara River, 41 km northeast of Baia Mare and 26 km south of Sighetu Marmaţiei. Summary: Due to the harmonious whole and the well-preserved paintings, the church of St. Parasceva has been included in the UNESCO World Heritage List. 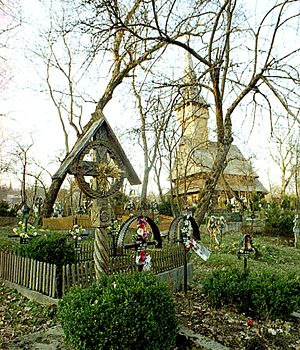 The Church of St. Parasceva in Desesti seen from southwest, behind the trees and crosses of the cemetery. The church was built of thick square-cut oak beams on a foundation of river stones. The upper beams are longer and form solid wing-like consoles that support the tall and heavy roof that is covered with shingles. The roof with double eaves covers the main rectangular part of the church, while a lower roof with single eaves covers the polygonal chancel. The entrance door to the church is on the west façade. The doorframe is wide, decorated simply with carved twisted rope and triangular wolf’s fang motif. Also the windows are framed with wolf’s fang, and the same motif is found on the exterior wall, between the two eaves. The church of St. Parasceva is one of the few churches whose plan has not been modified by the addition of a porch. The iconostasis divides the naos from the chancel, where only the priests may enter. There is an inscription in the chancel, which tells us that Radu Munteanu of Ungureni village and Gheorghe Zugravu (zugravu = painter) painted the interior walls in 1780. Munteanu started his career by painting icons in the Country of Lăpuş, and his influence can be seen in many of the wall paintings of the Lăpuş area churches. 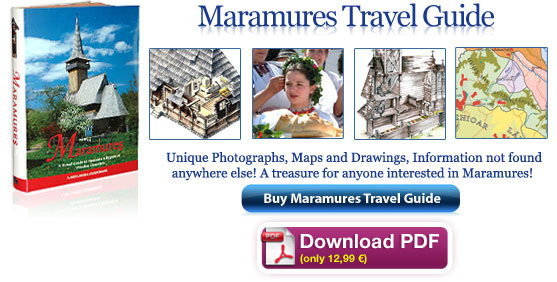 His icons are also found in Maramureş, but his fame is based on wall paintings. 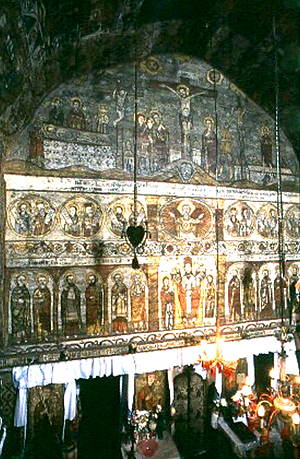 One of the most beautiful and complete mural painting entities is found here in the church of St. Parasceva of Deseşti. The famous artist Alexandru Ponehalschi painted the iconostasis and the other icons in the church in 1778-1780. The rounded tympanum of the iconostasis is dominated by the theme of The Crucifixion, as usual. On either side of the crucifix are the figures of The Virgin Mary and St. John the Evangelist. Below it is the figure of God, flanked by Prophets arranged in twos inside heart-shaped medallions. Below them are Apostles, also in twos, surrounding Jesus Christ the High Priest. Lowest down are four imperial icons. 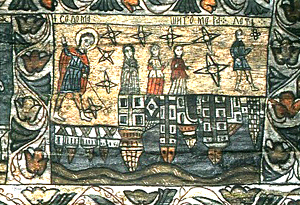 On the beam above the imperial icons is an inscription in Romanian with Cyrillic letters: “This holy frontal part was paid by Pop Ianus and his wife Marica and their sons Stephen and their parents Pop Grigorie Axenie for their eternal commemoration amen …June”. Jesus and the Samaritan Woman by the Well. The main theme of the pronaos is The Last Judgement that spreads on several walls. The most impressive scene is The River of Fire on the south wall, where the red burning river of hell carries damned souls into the maw of the Leviathan monster. In the centre of the vault of the naos are Jesus Christ Surrounded by Angels and The Virgin Mary. On the sides of the vault are painted themes from the Old Testament. A balcony for the chorus was added in 1920 on the west wall of the naos, which naturally destroyed some of the original wall paintings. The chancel vault is black with soot and only the portrait of Evangelist Lucas is visible in the eastern corner. In the upper part of the wall are scenes of The Annunciation, which shows Mary with a book in hand and the Archangel Gabriel against a background of sumptuous rooms, The Trial of Jesus, The Mocking, The Crucifixion, The Angel at the Tomb, and The Pious Women at the Tomb. 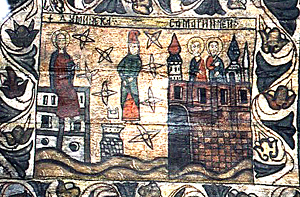 On the lower register are the standing figures of The Holy Bishops.